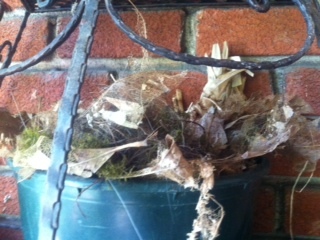 Just outside our front door, in a pot with a dead plant in it, we found a bird’s nest. After seeing a few nests ravaged on our property I assumed this one was destined with the same fate. The children watched for the mother bird, she was a rare sight, always in her nest and only every so often would she venture out. It took time to find out what type of bird she was because she was such a recluse. She’s a long-billed wren. Finally, one morning we heard the faintest of chirping coming from the nest. I began to hold my breath. Would the raccoons or squirrels get to the new birds? Would the crow that tore the nest in our cedar tree to pieces last week find this one as well? My son wanted to move the nest, bring it somewhere safer, but of course all we can do is stand idly by and watch how it plays out. The next morning we were amazed at how much stronger the voices were coming out of the nest. They had grown so much overnight. Still, no matter which way we twisted ourselves we couldn’t see inside the nest–they are amazing builders! Two days later I found a dead baby bird on our walkway. The nest was silent. I was certain they were all gone. How wonderful when later that afternoon the nest came to life with sound! They were alive! For days we watched the mother bird fly non-stop gathering food. The moment she took a breather they began screaming for her. I was exhausted watching her. And I was shocked to see she had a partner. There were two birds flying from the nest. My research tells me these birds mate for life. The male stays during the whole incubation process bringing the mother food, and then helping to feed the new ones. For some you a sight like this is commonplace, but for a city girl like me this was all new and very exciting! Once, as a child, we had found a pigeon (perhaps a robin–I can’t quite recall) with a broken wing on the sidewalk of a busy underpass. We brough the bird home and my dad patched him up (he was studying animal behavior at the time). We kept him on our back porch in a box until he was able to fly on his own. I had name the bird Gigi. The mother and father wren were very diligent parents. The moment one of us approached they would perch on the brick wall and wait for us to leave before either re-entering the nest or flying away. We waited and waited for a glimpse of these baby birds. Last weekend, I came out to throw something in the recycling bin. There were seven baby birds all over our front porch. Some were on the walls, on the ground, in the potted plants. They were scuttling around, trying out their feathers, stretching their wings, finding flight. The parents went into an uproar at my approach, and I quickly backed away. The whole process took about an hour and half and then they were gone. I snuck back for glimpses of them, bringing one child at a time with me. We saw them for forty-eight hours around our yard, in trees and bushes, getting stronger and stronger. Now we’re left with an empty nest. It’s gotten so quiet around here, I had become accustomed to constant shrill. My neighbor, who has shared the experience with us, insists that this must find a way into one of my stories. Perhaps it will. Or maybe the only story I needed to tell was this one here. Only time will tell. How about you: Do your every day experiences find way into your writing? How often do you use nature in your stories, if at all? Previous Multitasking, does it work? What a lovely experience and story. Thanks for sharing with us; nature is a huge part of my writing and inspires me greatly. Personal experiences less so, more those of friends, which I tend to weave together from the source of 3 of them, so none will recognise the other (to protect the not-so-innocent). Wonderful story. I was hoping for the happy ending! My experiences with nature constantly inform my writing. Yes, a happy ending 🙂 I kind of miss having them around though…. How lovely. Thank you for sharing your adventure, Jennifer. If this does make it into one of your stories or novels, I know you’ll write it beautifully. How odd, Linda!! I wonder if they do that? Could the mother have come back? How many times a season do they nest, any idea? So nice though that you were able to watch them grow. I had wished our little wrens had kept their home a little longer. I had no idea that once they ventured forth they never returned! You prompted me to do my own research and it seems like these wrens lay twice a season and every so often will re-use the same nest. I won’t throw the pot out yet–just in case! In my last manuscript, I described the hills-to-mountains area of the country I grew up in. So it isn’t the type of nature you blogged about, but geography was such part of the setting and the characters that it needed to be included. I’m with your neighbor; I hope the nestlings make it into one of our stories! Oh sounds interesting! I love it when the setting is an intricate part of the story! Great story. It’s amazing how many extraordinary things happen around us every day. Wisdom comes from noticing them. I use a lot of every day occurrences in my stories. I’m blessed to live in a city that constantly surprises me. Keeping our eyes open to what’s around us certainly is inspiring!